The topic of the project ‚The hidden world of bacteria‘ is the diversity of bacteria in local inland waters. When asked on the street where they would look for undiscovered species, people would answer „in the tropics“, „in the rain forest“ or „in the deep ocean“. Asked for groups with great numbers of novel species, frequent answers would probably be „insects“, „fishes“ and „orchids“. It is widely unknown that our direct surrounding, for example the flower pot on the window bench or the nearby lake, contains a lot of not scientifically registered species. 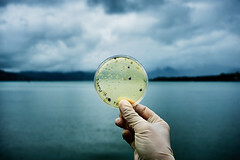 According to one of several estimations 99% of the about one million bacteria species are not scientifically described. For this reason, the aim of the project is to isolate and describe new bacteria species from surrounding inland waters with the assistance of students. The subsequent investigation and characterisation of the new species will include sequencing of the genomes. Genome sequences are of great importance to link the taxonomic research with the investigation of the microbial diversity and ecology. Students from six classes from five high schools with focus on natural science will take samples from different waters. Together with the project team they will cultivate and isolate from this samples bacterial strains. Some of the students will contribute to the phenotypical characterisation, the analysis of the data and the description of the taxa. From the samples of each class at least one new species shall be described in the time frame of the project. Every class will be able to attend the complete process from the isolation to the description of their bacteria species. Materials like video animations and instructions for experiments will be shared on a web page where furthermore the progress of the project will be documented.